Finn and the Swirly Spin – A new unique slot from NetEnt packed with Bonus Features! Today sees the official launch of NetEnt’s new slot Finn and the Swirly Spin which features a unique swirl style slot reel layout and comes packed with a variety of exciting base game features and free spin bonuses to unlock. 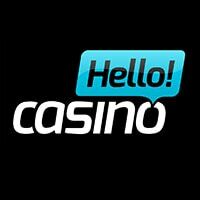 Casinos such as Thrills Casino, SuperLenny and Kaboo Casino already have this slot live and playable today if you are wanting to check this new slot release out immediately. The Finn and the Swirly Spin slot uses a 5×5 grid layout with the “Swirl” layout spiralling into the centre of this slot, the pays are created either horizontally or vertically when 3 or more matching symbols line up. The main objective of the base game is to get the special “Key” symbol into the centre of the swirl, this is done after wins are created during the spin and symbols are then removed in an Avalanche style from the reels with new symbols added to the swirl at the start, sounds confusing but it’s fairly straightforward once you have played this slot. 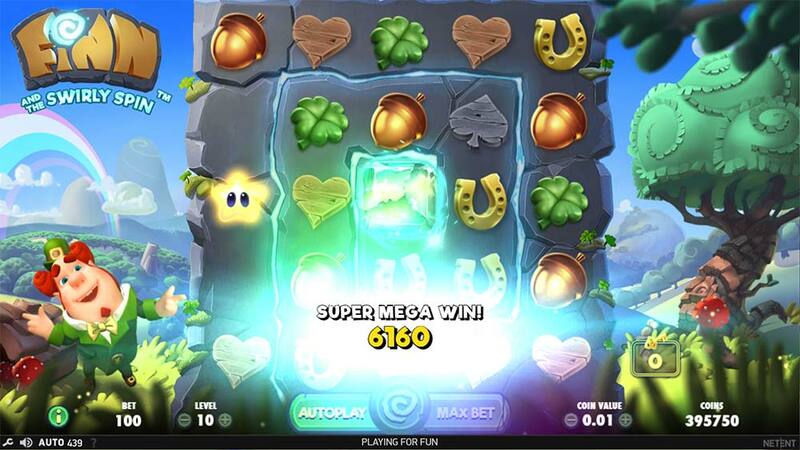 Along with this unique layout, you will also find 4 different randomly triggered base game special features which can definitely help in getting to key to the centre of the swirl quickly, along with creating some decent wins on the way. 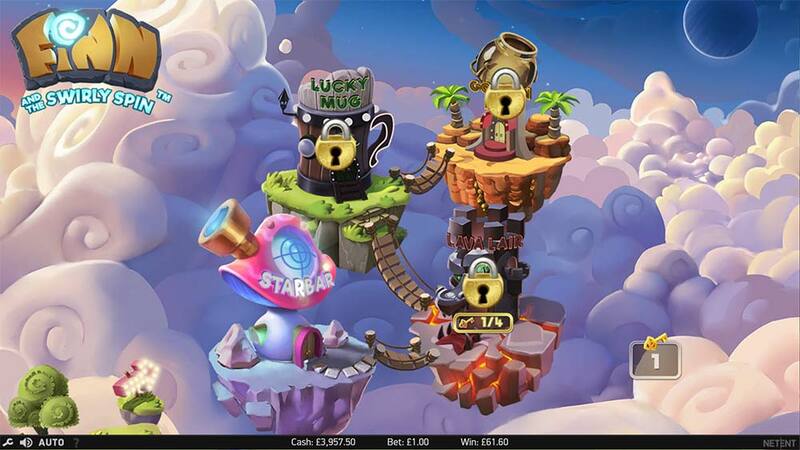 Once you have successfully got the Key symbol to the centre of the swirl you can then start unlocking the 4 unique different free spins rounds on offer. Check out the gameplay video below to see most of the special features in action! There are 4 different randomly activated base game features along with 4 unlockable free spin choices on offer in Finn and the Swirly Spin. Starfall Wilds – Wilds are added to the reels at random or in a line formation. Dragon Destiny – Destroys a random number of symbols creating an Avalanche and win. 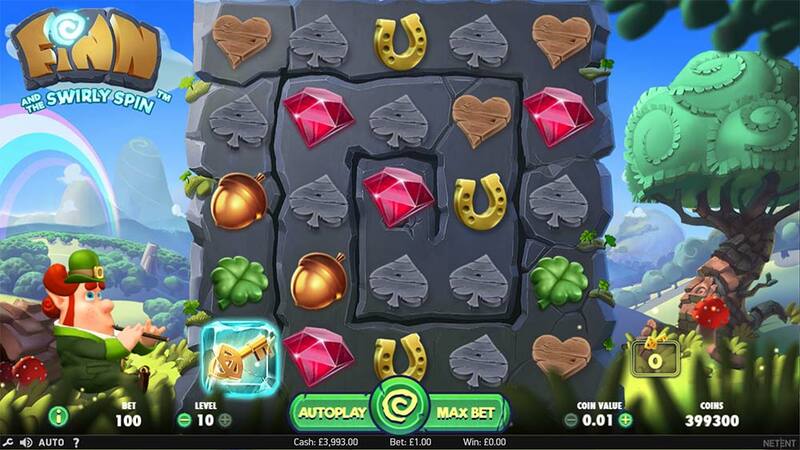 Irish Luck – A horizontal or vertical line of symbols is added to the reels creating a win. Magic Transformation – All heart and spade symbols transform into a higher paying symbol. The free spins modes are unlocked and require a specific amount of keys to be gathered before they become available to play, the different modes are as follows. 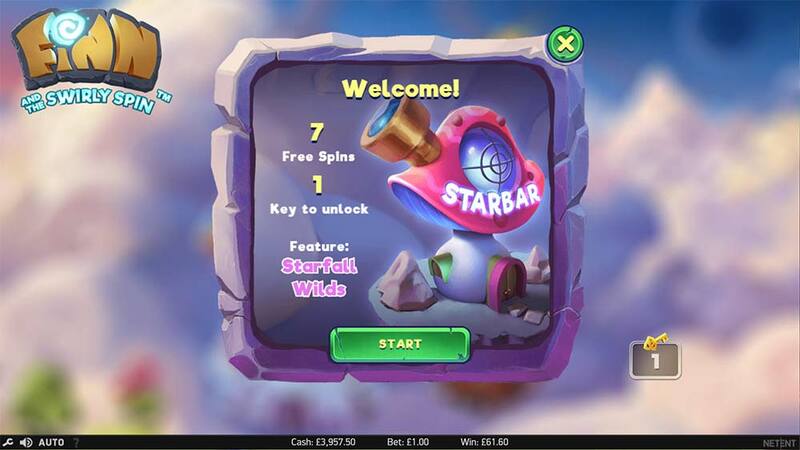 Star Bar Free Spins – 1 key to unlock – 7 free spins with Starfall Random Wilds. 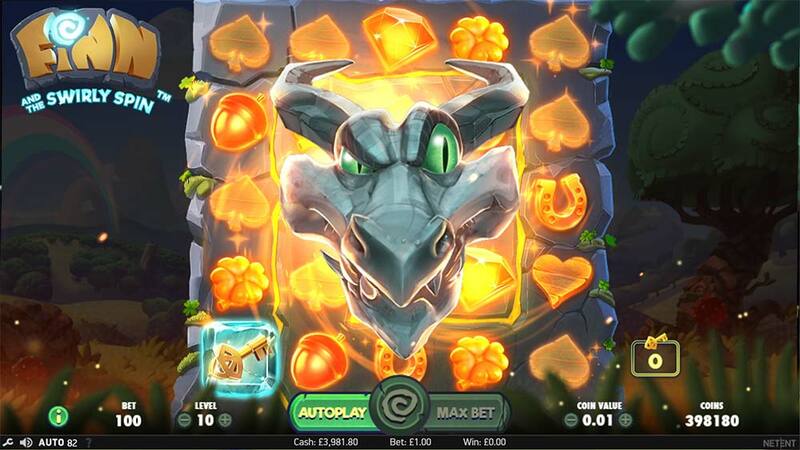 Lava Lair Free Spins – 4 keys to unlock – 3 free spins with Dragon Destiny feature. 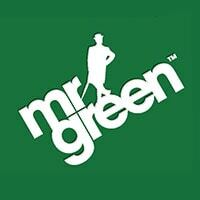 Lucky Mug Free Spins – 9 keys to unlock – 4 free spins with Irish Luck feature. Golden Pot Free Spins – 16 keys to unlock – 2 free spins with Magic transform Feature. 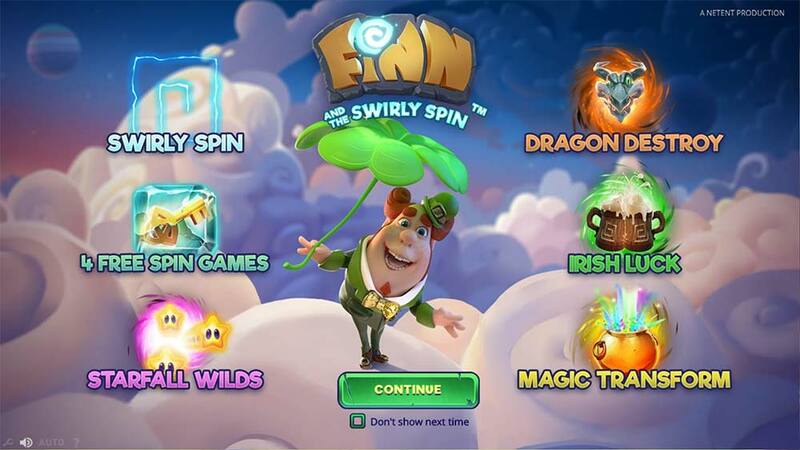 Finn and the Swirly Spin Slot is a very polished release from NetEnt, from the opening cinematic trailer through to the design, graphics and awesome animated Finn character on this slot. Packed with lots of interesting random features and unique unlockable free spins along with the “swirl” layout this slot offers plenty of new things to check out. In our playtest, we did struggle at times to trigger the free spins, but there was plenty of random features occurring to keep the base gameplay interesting. We have yet to reach the final Golden Pot free spins mode but given the similar base game feature, it looks to offer some decent potential for creating many matching symbols.